ROSS F. LOCKRIDGE, SR. & JR.
Ross F. Lockridge, Sr., The Labyrinth, New Harmony Memorial Commission, 1941. Ross F. Lockridge, Jr., Raintree County, Houghton Mifflin, Boston, 1948; republished by Penguin Books, 1994. The novel spawned a movie, Raintree County, featuring Montgomery Clift, Eva Marie Saint, Elizabeth Taylor, and Lee Marvin. A critique of the movie is one of the many attractions accessible at the Raintree County Home Page. Larry Lockridge, Shade of the Raintree: The Life and Death of Ross Lockridge, Jr., Author of 'Raintree County', Viking, 1994. So, as you see, we have three generations of Lockridge authors! The golden rain tree shines through the titles of Raintree County and Shade of the Raintree, and it is engraved in gold on the front cover of The Old Fauntleroy Home. Prior to writing his great novel, Ross Lockridge, Jr. had written A Pageant of New Harmony. It was performed on June 20, 1937 in connection with the second Golden Rain Tree Festival, the first having been celebrated in June, 1936. "The 250 actors were all in place at the old Rappite Cemetery," writes Larry Lockridge in Shade of the Raintree, and "three thousand spectators made a pilgrimage to New Harmony for the great Pageant." The author, however, all but disclaimed the work. He did not attend in 1937 or in succeeding years when the Pageant was performed. "The local paper," Larry Lockridge continues, "raved and said the Pageant was destined to become New Harmony's Oberammergau. 'Ross Lockridge, Jr. gave to the world a masterpiece of historic composition.'" In the year 1826, the Scotch philanthropist Robert Owen founded New Harmony on the Wabash River in southern Indiana. Down the Ohio and up the Wabash came a Boatload of Knowledge÷scientists, artists, and educators imported from the East and from overseas to found a New Moral World in the western wilderness. People were invited to come and join a paradise regained by innate human goodness. The noble experiment lasted two years and collapsed in the usual picturesque wreckage of innate human selfishness and inefficiency. But many gifted people remained and fostered an interest in science and art so much advanced for the place and the period that New Harmony came to be known as the Athens of the West. Among the New Harmonians were students of natural science, and it was one of these who brought to New Harmony the seeds of an exotic tree, which he planted by the gate of his house. The tree was the Golden Raintree, which "in late June or early July...bloomed with a delicate yellow flower and dropped a rain of yellow pollendust and petals." Thus, by chance, the State of Indiana did acquire a mysterious seedling of Asia, a true Raintree. But for a long time this tree flourished only in a little town in the southwestern corner of the State, while the county named for such a tree had not a single specimen within its boundaries, as far as anyone knew. 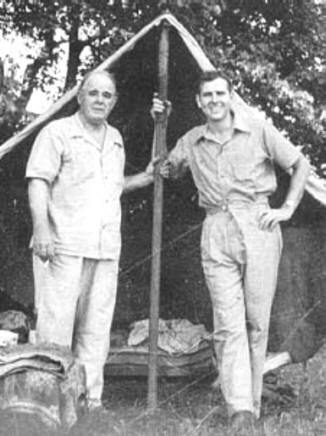 I thank Larry Lockridge for permission to use the photo of his father and grandfather, taken by Ernest Lockridge, age 3, during a camping excursion in 1942, and to quote from Raintree County and Shade of the Raintree. Be sure to visit the Raintree County Home Page.